♥Sugar & Spice…because even the sweetest of the sweet knows that there are times when a splash of sass is precisely what the doctor – er…retail therapist – ordered; and there is no better way to add just that to one’s wardrobe – in an affordable fashion, of course! – than via an ambrosial over-the-knee sock from Sweet Marcel. Bright colors mingle with feminine patterns; saucy backseams find themselves splayed upon pastel hues; and Parisian architecture is recreated in the form of charming cozy knits gracing one’s tootsies! Allow Sophia to peek out of your Regent Savoy Quilted Glossy Boots from Hunter Boots; layer Joelle or Julia over your black SPANX Tight End Tights for a bit of extra dimension; or rock the demure Victoria with your Graham & Spencer Winter Silk Blouse for a Marie Antoinette-approved look. How will you wear your girls, my loves? ♥The Little Black Dress, The Little Black Dress, or…The Little Black Dress…because a feisty femme fatale such as yourself knows that a closet sans little black dress is no closet at all; luckily there is 22 Ways to Say Black to reinvigorate one’s barren wardrobe. Taking place on September 20th at Philips de Pury in New York City; 22 Ways to Say Black is a glamorous charity auction featuring a total of twenty-two custom little black dresses crafted by everyone from Diane von Furstenberg to Fendi and Armani. Each piece is encrusted with shimmering Swarovski Elements; but the truly best feature is the fact that 100% of the proceeds will benefit the American Cancer Society and France’s La Ligue Nationale Contre Le Cancer. As you already know, kitty cats; charity never goes out of style! ♥Once You Pop…because the glamourai that you and I both know you are is aware of the peu fact that indulging in sweets is a heavenly experience synonymous with coming into possession of front-row seats to Marc by Marc Jacobs; thus the reason that your selection of desserts must be equally as divine as you yourself – enter…Browniepops. Part lollipop, part brownie…Browniepops are a hoity-toity conglomerate of moist, chocolatey goodness packed onto a stick sucker-style; an aesthetic that is equal parts scrummy and perfect for keeping your pretty paws clean (so no worries about finding sticky fingerprints on your new Madewell Woodcut Print Blouse!). Tell me lovers, which flavor are you eager to savor…cream cheese swirl, caramel, toffee, or perhaps a seasonal hors-d'oeuvre to welcome in fall 2010? ♥Dressed to Kill…because the fashionable femme fatale that is vous knows that a pretty party dress or sassy special occasion frock is not a maybe, not a might, but an absolute must for one’s wondrous wardrobe; and there is no more splendrous location to pick one up than David’s Bridal. Ball gowns for the debutante; leg-baring hemlines for the coquettish flirt; leopard print for the wild child. As Coco Chanel once said, “Look for the woman in the dress. If there is no woman, there is no dress.” The question is…which dress will you be donning, darlings? ♥Smell the Season…because a Pumpkin Spice Latte may bring the taste of fall to the interior of your toned tummy; but sometimes it’s the scent of autumn that you crave – and Crater Lake Company’s Warm Pumpkin Bread Body Scrub is just the thing to give it to you. Made up of a blend of pumpkin flakes, pumpkin oil, pure cane sugar, shea butter, and other yummy ingredients; the Warm Pumpkin Bread Body Scrub will keep the smell of autumn lingering around you from morning to night. But be warned dolls; you may be plagued with the urge to indulge in pumpkin-based desserts while wearing! Fall is my FAVORITE!! I love your smitten saturday babydoll! The brownie pops look delish! I want one right now . . . at 8:46 in the morning, ha! And I keep hearing about pumpkin spice lattes--gonna have to try one pronto. And what a cool charity auction! 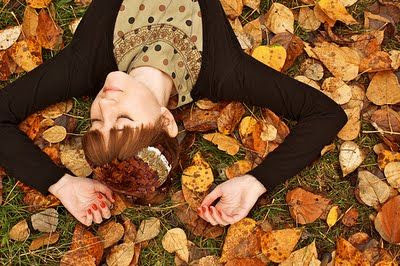 I'm glad fall weather is here already :) And that picture looks so relaxing! So love the autumn pic..and so many sweet goodies today! Mmm, I definitely need a pumpkin spice latte now! This week I've been smitten with the sweater-shorts I wear for dance---so cozy! I love the cute socks! Great pic !! I LOVE FALL !! That pumpkin body scrub sounds absolutely epic! Hope you have a grand weekend. I adore this post and the picture is so cute! The 22 Ways project is definitely for a really good cause. And the dresses from David's Briday are gorgeous. Browniepops sound sooo good! And that Madewell blouse is stunning. This post just makes me Saturday so much better! I love everything you're smitten with- dresses, browniespops, and an awesome Fall body scrub. Yes to Fall! And I do love that photo and I'm glad you do, also! Great Saturday post! ooh la la..so much to look through. Just got back from a mega craft show. Its always interesting to see what everyone is offering. So many are wanting to have party-time, from chocolate, to dips and purses and jewelry. It was fun and exhausting to go with my Mom. Really, together time. Lollipop + brownie?? Yes please! That sounds delicious. Brownies and lollipops are love. Whoever came up with the idea to put them together should be honored with a Nobel Peace Prize. Loveee saturdays in your blog!! Browniepops?? Amazing! That is the greatest idea ever! Thanks for the link to Sweet Marcel! Oh my gosh, LOVE the printed otk socks:) I'm also intrigued with 22 Ways to Say Black. What a great event! I will eagerly pop brownies with a bottle of Champs! Choco heaven with bubble mania. love this post. everything about it is beauty. you are really such a fun blogger to follow! are you a writer by career because you are really talented. I love it when ladies where over-the-knee socks. so stylish. and the ones you recommend look fun! great selection, Erika! I am crazy for fall to begin...and it might be this weekend...well sort of...Texas doesn't get much fall...but the socks and smells of autumn? I love it all! ahhh knee socks!! i have the most amazing grey, over-the-knee pair and i just want to wear them all the time!! i'm currently bidding on ebay for my next season winter coat and i'm looking forward to jumper dresses, leggings and boots!! omg...must have pumpkin spiced latte ..NOW!!!! Mmm, hooray for the delightful scent of pumpkin!